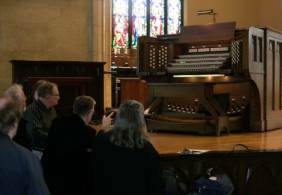 Huw Lewis provides the group with an overview of the Skinner console. Terry Jankowski explores the registration during his turn at the Skinner. 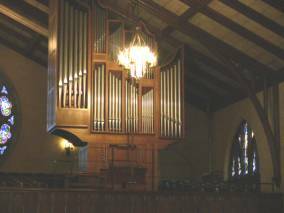 The Pels and Van Leeuwen tracker organ at the rear of the chapel. Huw Lewis pulls a few stops for Jim Wilkes at the Skinner console. Terry Jankowski takes his turn at the Pels and Van Leeuwen at the rear of Dinment Memorial Chapel. 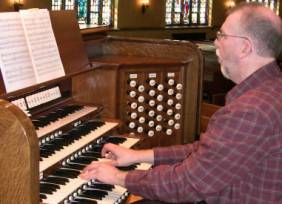 Brian Sweetman takes a solo run on the magnifi-cent E. M. Skinner organ. 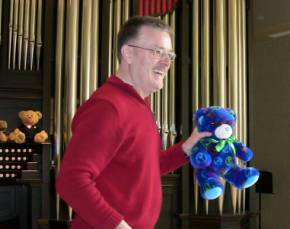 Dr. Lewis presents one of the many Teddy Bears given to him over the years by his organ students. MaryAnn Balduf plays the Walker for a number of interested bears. 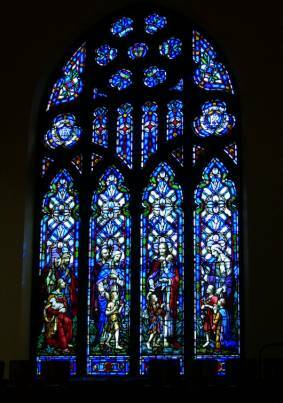 Two of the beautiful windows in Dimnent Memorial Chapel. 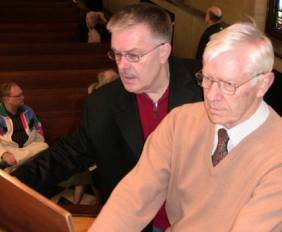 The April 2010 meeting of the Michigan Chapter of the Organ Historical Society convened at 10:30 a.m., April 10 at Dinment Memorial Chapel at Hope College, Holland, Michigan. 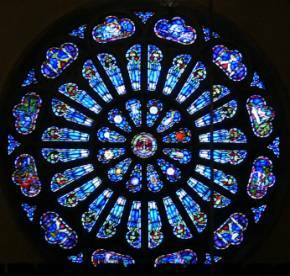 Present were Carl Balduf, MaryAnn Balduf, Leonard Feerick, Brooks Grantier, Terry Jankowski Brian Sweetman, Mark Wells, Jim Wilkes and Huw Lewis, Hope College Professor of Organ and College Organist, who graciously hosted the meeting. 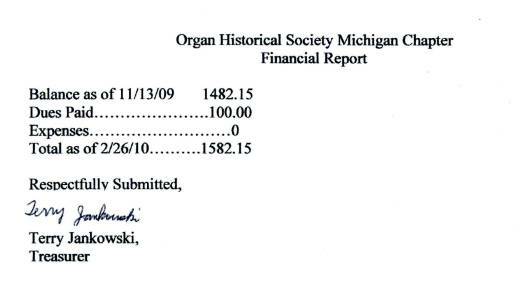 By unanimous consent, because of the driving distances involved for many attendees, the formal meeting was dispensed with, although Terry Jankowski did present the treasurer's report, showing no change from the previous report, found below. 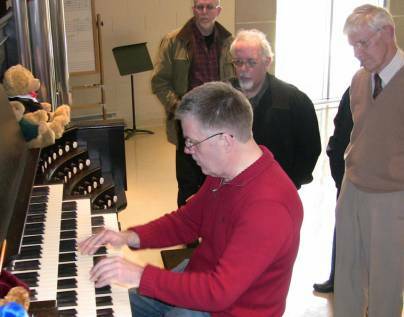 The group then undertook Dr. Lewis's well-guided tour through the marvels of the exceptional instruments found at Hope College. 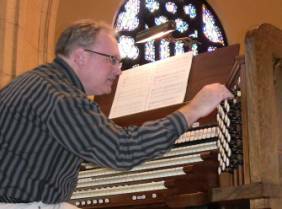 Each instrument may be accessed by clicking on the links below. Following the demonstrations, members of the group adjourned to The Curragh Authentic Irish Pub for a lunch that befitted the rest of this exceptional day at Hope College. 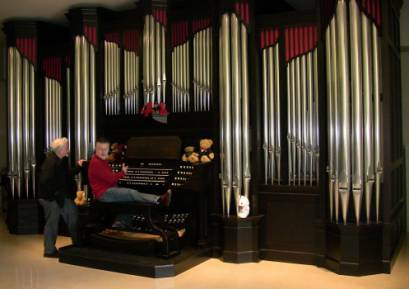 Huw Lewis demonstrates the J. W. Walker organ as (l-r) Briam Sweetmen, Brooks Grantier and Jim Wilkes savor the sounds. 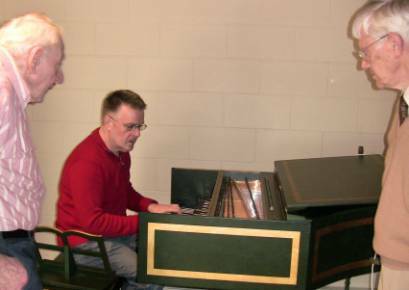 Dr. Lewis plays the Kingston Harpsichord as Leonard Feerick (l) and Jim Wilkes admire the big sound. 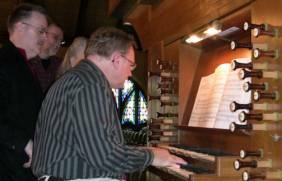 Huw Lewis makes a point about the superb J. W. Walker organ in the Hope College organ studio as Brooks Grantier watches closely. A gooey dessert makes for happiness after lunch at The Curragh Authentic Irish Pub. Left-to-right are Leonard Feerick, Terry Jankowski, Brian Sweetman, Huw Lewis, MaryAnn Balduf and Carl Balduf. 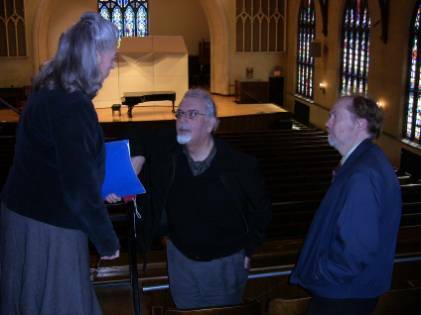 MaryAnn Balduf, Brooks Grantier and Mark Wells confer in the balcony of beautiful Dimnent Memorial Chapel. 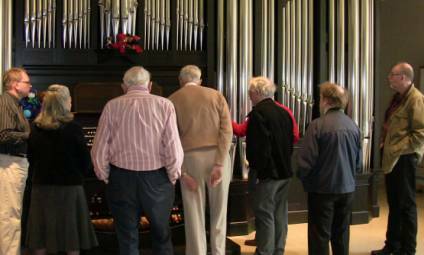 All gather around the J. W. Walker organ in the Hope College organ studio.